A lot of you are probably quite familiar with ClockworkMod Recovery, hands-down the most popular custom recovery out there for ROM junkies. Developer Koush has just released another ambitious community-minded project, ClockworkMod Tether, and it’s pretty much exactly what you’d expect. The non-market app connects to a href=”http://www.microsoft.com/WINDOWS” rel=”homepage” target=”_blank” title=”Windows”>Windows, href=”http://www.kernel.org/” rel=”homepage” target=”_blank” title=”Linux”>Linux or OS X PC over a USB connection (not WiFi or href=”http://www.bluetooth.org/” rel=”homepage” target=”_blank” title=”Bluetooth”>Bluetooth), and doesn’t require any special root permissions or other mods. A separate PC app is required, much like other, similar programs that have been in use for years. Naturally, the app is free. Koush (Koushik Dutta) claims that the program is undetectable by carriers, almost all of which charge for the privilege of sharing your paid smartphone data. The app is in its alpha release, but according to early comments, it’s already commendably stable. The developer notes that while most of the software nuts and bolts are in place, the user interface is unfinished, and will be seeing a lot more polish in the future. The current version will expire on Saturday, January 7th, but a newer version should be out by then. Future releases may include a Bluetooth version, as well as better client apps for all supported operating systems. Trying it out on my Galaxy Nexus with a Windows 7 PC seems to work like a charm, though it’s not quite as fast as official tethering. 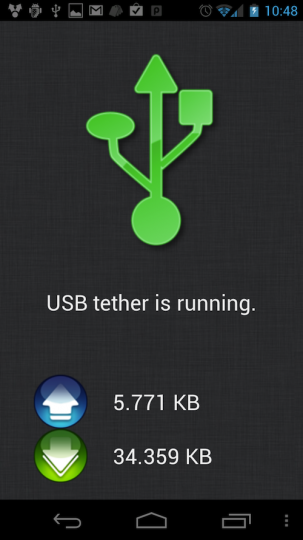 Koush is one of the most highly regarded modder/developers out there, and with good reason – expect to see fast and comprehensive updates for ClockworkMod Tether over the next few months. Don’t expect this one in the href=”http://www.android.com/market/” rel=”homepage” target=”_blank” title=”Android Market”>Android Market any time soon. I don’t get it- how is this legal?